Combination Starter - Solution Control Systems Inc. Combination Starter - Solution Control Systems Inc. 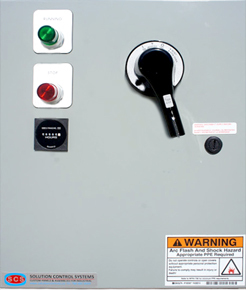 Reversing or non reversing motor starter comes with fused disconnect or molded case motor circuit protector or thermal / magnetic breaker. These disconnecting means can be rotary type handle on the front door or flange mounted handle operator which are lockable in off position. We can modify these as per you application like nema style contactors/overloads, electronic overloads, overload reset button, elapsed time meters, single phase application, sealed contactors, push to test lights, remote start stop feature, motor monitoring relay, single phase protection, surge protection, reverse rotation protection etc.